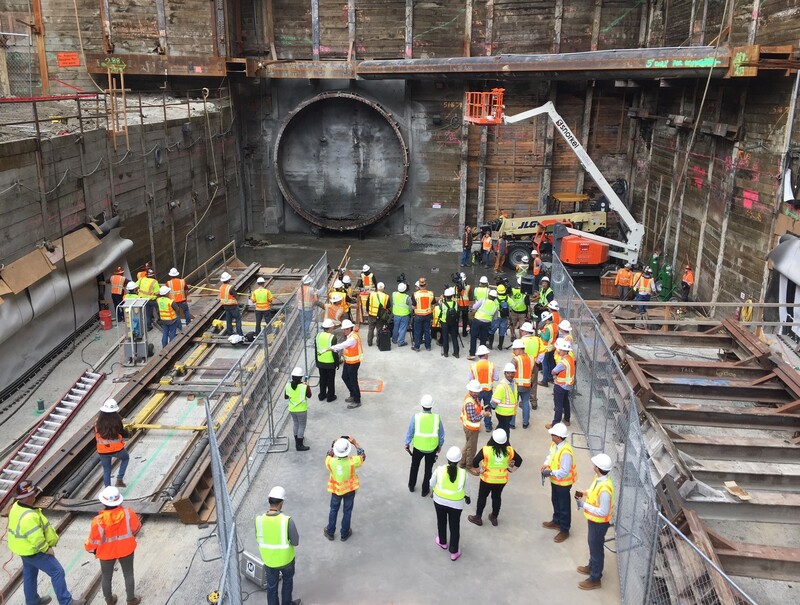 Construction crews look on as the Regional Connector Tunnel Boring Machine breaks through at Grand Avenue station. The circular TBM face is visible behind the tunnel rubble. All photos by Joe Linton/Streetsblog L.A. This morning, Metro celebrated a milestone in the agency’s construction work on the Regional Connector subway. 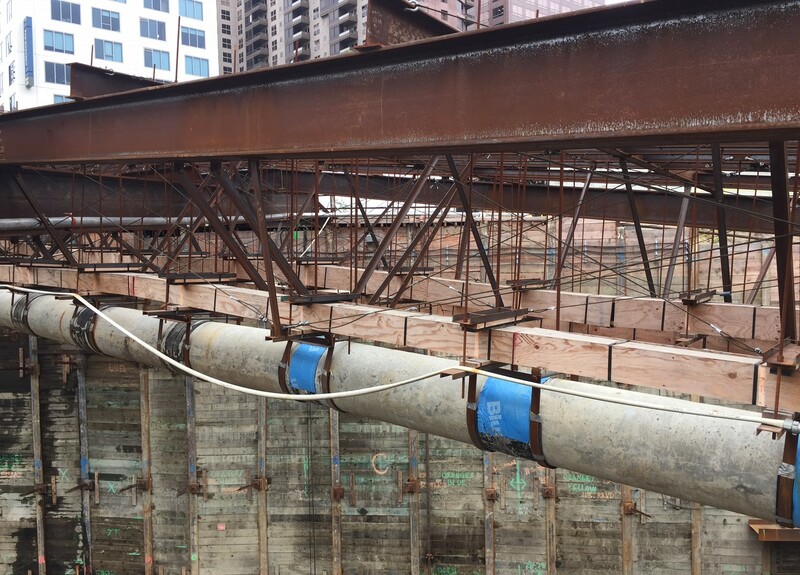 The Regional Connector tunneling machine broke through at the site of the future Grand Avenue station, to be located at the intersection of Hope and Second Streets, right behind the Broad Museum and connected to it via a pedestrian bridge. 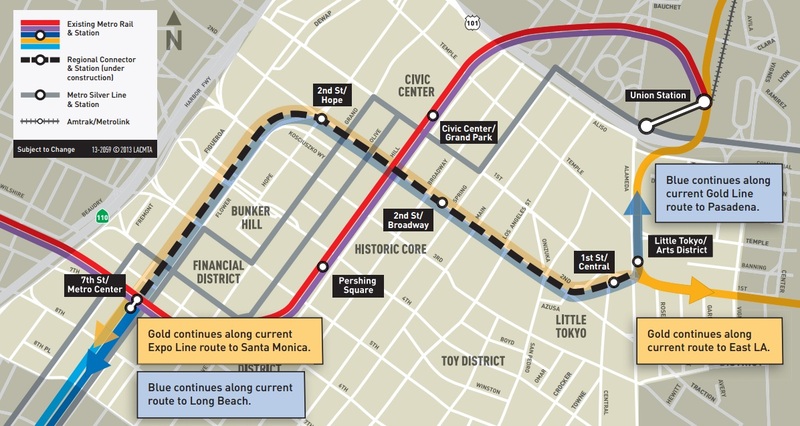 The Regional Connector is a $1.55 billion 1.9-mile light rail subway that will connect the Blue, Expo, and Gold Lines. The subway is expected to open to the public in 2021. 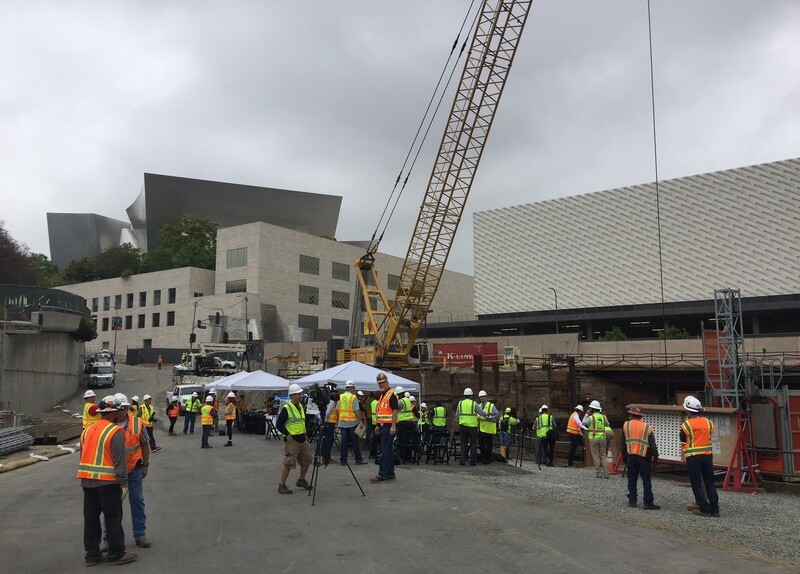 The Regional Connector Tunnel Boring Machine “Angeli” was ceremonially lowered in Little Tokyo last October, just before the Measure M vote. Angeli has been digging under downtown L.A. since early February. To date, the TBM has dug about 4,400 feet. 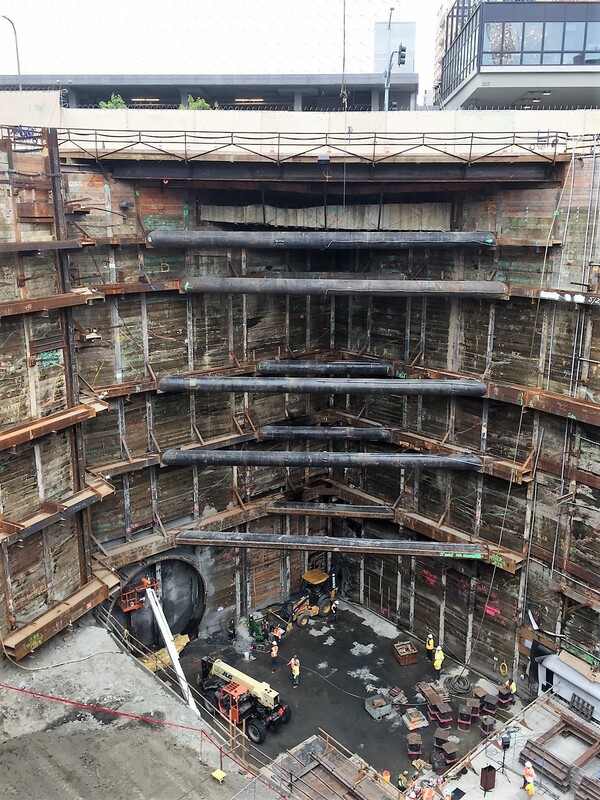 It still has another 1,000 feet to go to get to its destination, a TBM “extraction pit” located at 4th and Flower Streets. 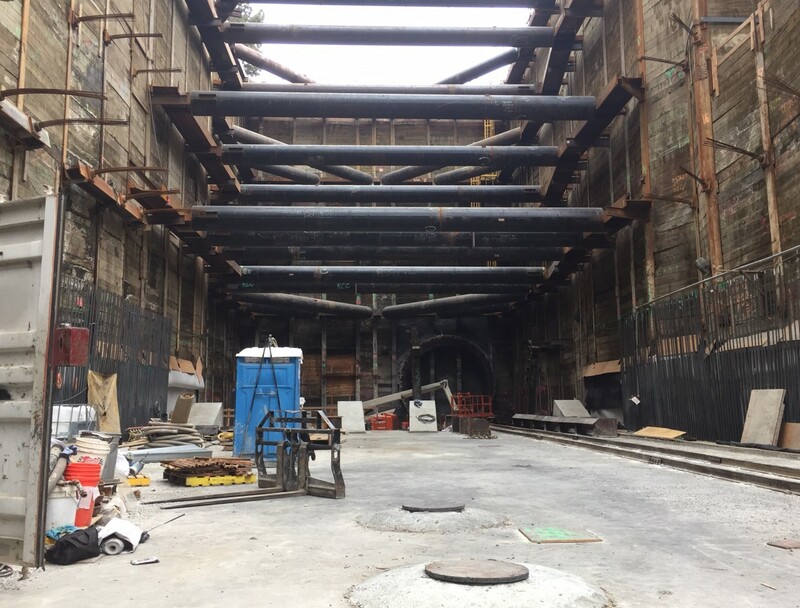 From there, the remaining tunnel connection to the Blue/Expo Line at the 7th Street Station will be constructed via cut-and-cover construction. 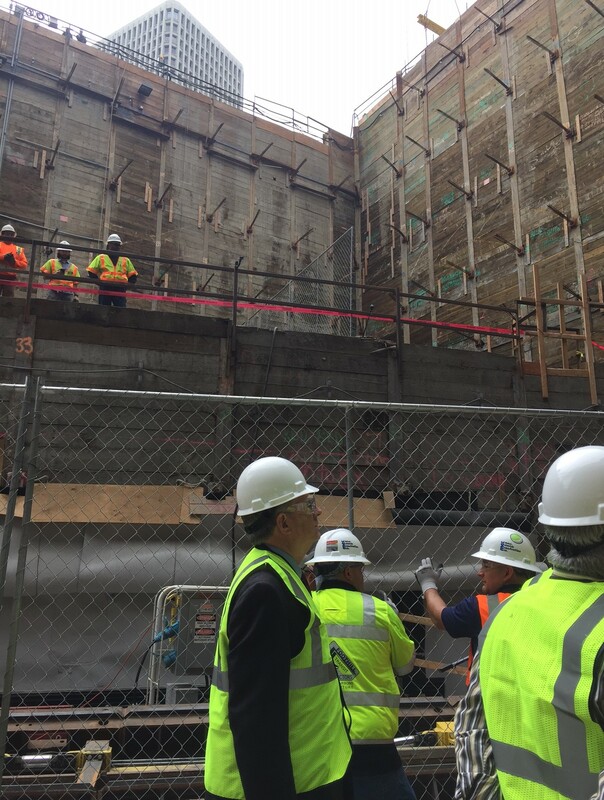 After extraction, the TBM will return to Little Tokyo where it will bore a second parallel tunnel. Though the TBM started the day just eight feet away from the station, this morning’s breakthrough took a little longer than expected, perhaps par for the course for the already delayed and over-budget Regional Connector project. The photogenic breakthrough was announced for 8:30 a.m. Press were requested to arrive early to allow time to descend into the construction pit. By about 10 a.m., press, construction crews, and a few dignitaries were assembled at the track level of the future Grand Avenue Station, about 110 feet below the surface of Bunker Hill. 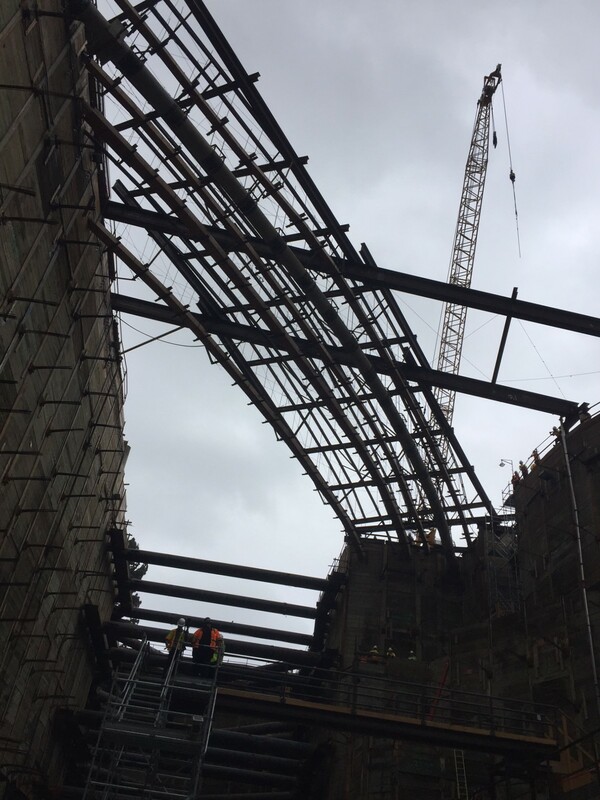 For about 20 minutes eyes and cameras had been focused for a while on an unmoving 21.6 foot-diameter shotcrete disc where the breakthrough was to take place. The TBM’s rumbling could be heard, though it sounded far off. Then it was announced that the anticipated breakthrough would be delayed about an hour and a half. Right after impatient media crews thinned out, cracks appeared in the shotcrete wall. The TBM finally punctured the wall just before 11 a.m.
Below are more photos of this morning’s event. Construction is taking place at 2nd Street and Hope Street, right behind the Broad Museum and Disney Hall. A major difficulty for Regional Connector construction has been interacting with utilities. In this photo, a near-surface level concrete storm drain and several other boxed utilities are suspended high above the construction site. Another view of the suspended storm drain, from below. The future Grand Avenue station site, 110 feet below the back of the Broad Museum (visible at the top of the photo). 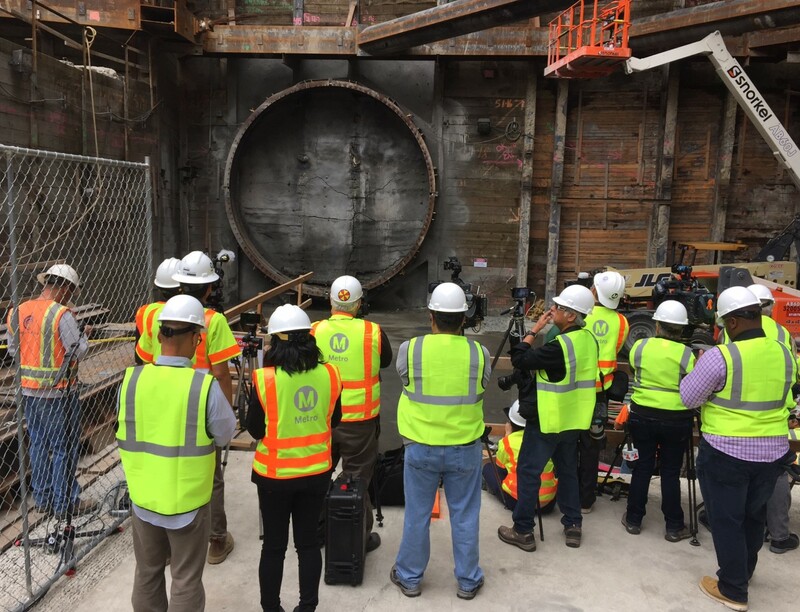 Media, builders and dignitaries gathering for the Regional Connector TBM breakthrough. Metro board Chair John Fasana on hand, awaiting the TBM breakthrough. Cracks appear on the surface indicating the TDM is approaching. The TBM will cross the station and continue here at the southern end of the Grand Avenue station, where it will tunnel for another 1000 feet. 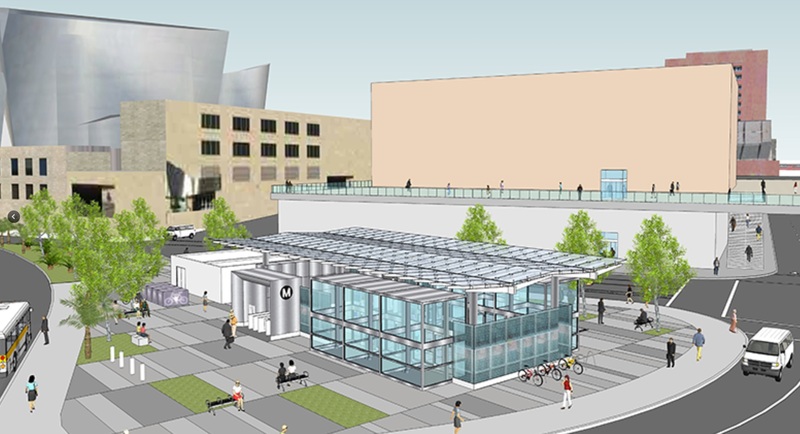 Metro board committees are expected to move forward with a bridge to connect the Regional Connector station with Grand Avenue. The bridge would be immediately south of the Broad Museum.